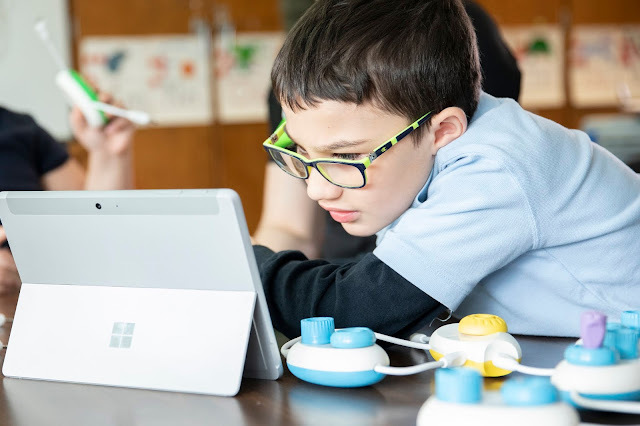 Student looks closely at Microsoft tablet, Code Jumper pods sit on the table in front of him. Imagine a future where people who are blind or visually impaired have just as great of a chance of landing a high paying job as their sighted peers. Now get excited – that future is closer than ever before! Code Jumper is an incredible innovation that teaches children, regardless of their level of vision, computer coding skills. 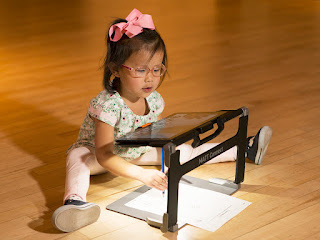 Children not only learn basic programming concepts, such as sequence, iteration, selection, and variables, but will also be encouraged to think computationally, such as solving the same challenge in multiple ways. Code Jumper pods are seen from above. A hand holds on to a pod, twisting a knob. Robin Lowell, a special education teacher, is working on the educational curriculum that will accompany Code Jumper. By plugging in small pods, students are able to build strands of code. 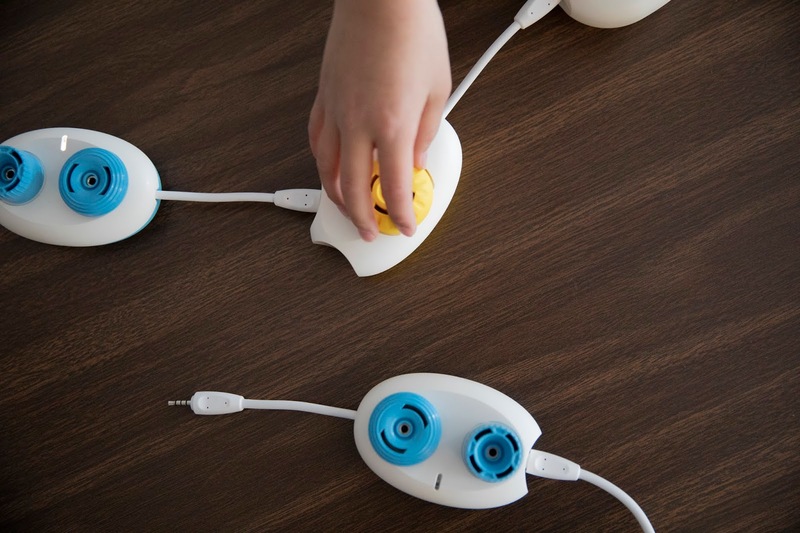 They can change sounds to create stories, songs, and jokes. Code Jumper makes it easy to start with a simple concept and work up to more advanced coding concepts as you add pods with different functions. Student stands behind table smiling. Code Jumper sits on table in front of him. 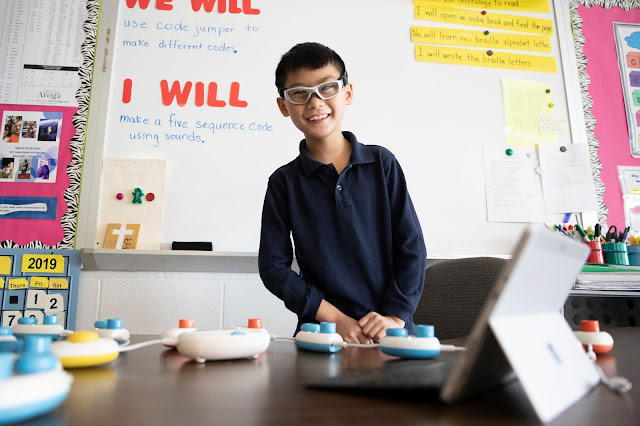 Code Jumper isn’t just teaching the basics of coding – it also teaches important life skills like collaboration, problem solving communication, creativity, and perseverance. Student works with an APH staff member to hook pods together to create a strand of code. Code Jumper takes a complex idea and makes it easy and fun for everyone to learn. The importance of this new learning tool goes far beyond the hours of fun teachers and students will have using it. Computer science related jobs are expected to grow 2 times faster than the average of any other occupation. According to the U.S. Department of Labor, the average wage for a software developer is more than 100 thousand dollars a year. With more computer science jobs available than there are people to fill the positions – this field holds great promise for young people who are blind or visually impaired. 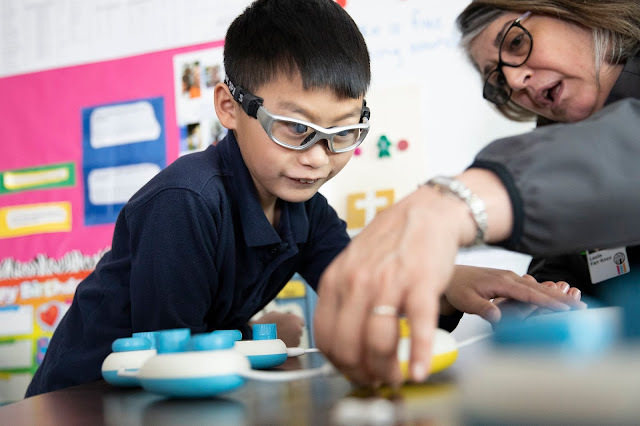 With Code Jumper helping develop early computer coding skills, young people who are blind or visually impaired can move on to have an important career in the field of Computer Science. Code Jumper was created by Microsoft, and will be distributed by American Printing House. This incredible new product will be for sale before the 2019-2020 school year. To learn more, visit www.codejumper.com.